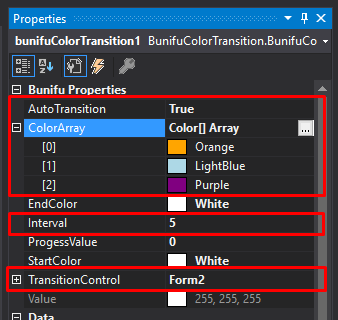 Bunifu Color Transition is a component that makes possible the transition of various colors from one color-state to another. It's super useful when you want to show different states / progression of an activity or task. Simply locate BunifuColorTransition control in your toolbox and drag it on to your form. You can then customize using custom properties as it will be elaborated later in this article. StartColor - is the start color (the initial color) and EndColor is the target color (the color that stops the transition). ProgressValue - is a value between 0 and 100 that sets the gradient between the StartColor and EndColor . AutoTransition - is a boolean that allows you to set automatic transition of specific TransitionControl. 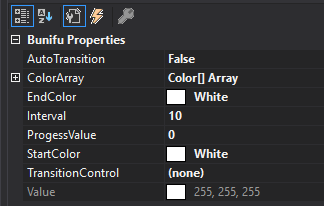 ColorArray - is array of colors to transition from and to. Interval - is the speed of transition between the color arrays. We want to change the background color of our form (BackColor) in a gradient from White to Red according to the value pointed by a Bunifu TrackBar. 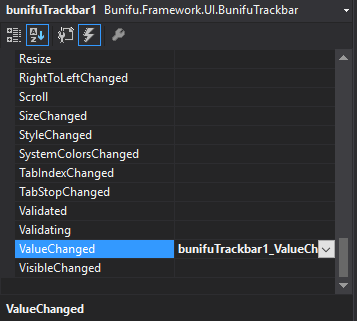 The code above sets the progress value of our Bunifu Color Component, to the track bar value. After that we set the back color of our form to the Value pointed by our component. We hope BunifuColorTransition will help improve user experience in your design. Should you have feedback or suggestions please send us via chat on the bottom right corner of the screen.